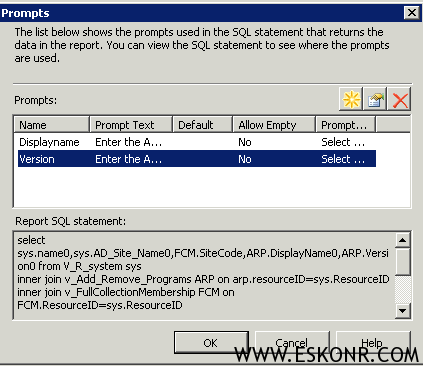 If you have referred to my previous report linked report http://eskonr.com/2012/05/sccm-linked-report-count-of-computers-assigned-to-specific-ad-site/ this would be easier for you to go. and click on the prompt (hand symbol) and select column 1 for Display name and Column 3 for Version as prompt shown like below. 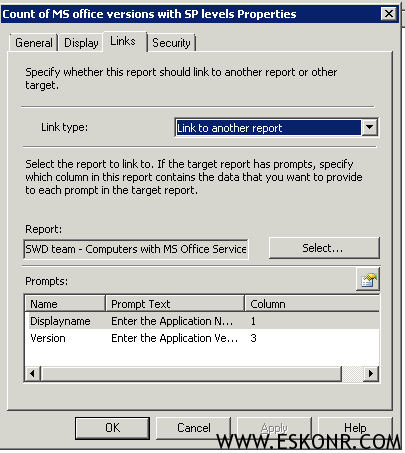 10 Responses to "SCCM Linked report MS Office Version with Service Pack installed machines"
Thank you! That worked! I removed all fancy quote ("'') and the error went away. But now I'm getting a whole new one. I'm getting an error message that says that there is another syntax error near 6361. I get that error with or without commas in the code. check if you have replaced the quotes for 11.0.6361.0 ? double check the syntax errors once again. [Microsoft][ODBC SQL Server Driver][SQL Server]Incorrect syntax near "". Any idea what I could be doing wrong? After I created the first report (report 2), I got a must declare scalar variable "@Displayname" error, but that went away after I deleted the @ symbols. Please replace the quotes "" as they are fancy quotes converted by blog. thanks for letting me know.How frequent does it occur ? i haven't noticed any such .just to make sure if everything is on track. Hi Eswar, will this be possible to tel step by step because things are shuffled and i m getting error on both SCCM Report and SQL query. it is clearly given in blog saying create report 2) first and then go with 1 and then link these report. What are you finding difficult ? if you get any errors with syntax,try replacing the quotes (',"") again since blog converts them to fancy quotes.